Our cows are a mixture of breeds including Ayrshire, Jersey and Holstein. We milk twice a day at about 6 am and 6 pm. The cows we are currently milking produce over 100 lbs (about 13 gallons) of milk each day, so we have plenty of room to grow our customer base. We have a milk cooling tank that we use to cool our milk very quickly. Our milk has a clean, refreshing flavor that we love. Our cows are rotationally grazed on pasture as much as the pasture will allow in Spring, Summer and Fall. We always supplement their diet with high-quality alfalfa to make sure they keep up a healthy body condition. We also feed the milk cows a small amount of organic grain in the barn while we are milking. We never use steroids or hormones and would only use antibiotics as a last resort. Even though the dairy antibiotics have no withdraw time (meaning they do not come through in the milk), we would not use milk from a cow for at least a week after the last use of antibiotics as a precaution. 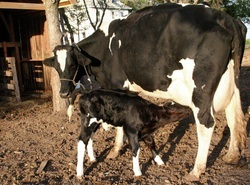 There are six major breeds of dairy cows. Our cows are a mixture of Ayrshire, Jersey, and Holstein. We utilize a three breed rotation to benefit from cross-bred vigor. We get the best traits from all of the breeds. Each of the breeds have a little bit different traits, but those traits vary just as much from animal to animal within each breed. We prefer smaller, deep bodied animals with large capacity that look like the English or old-fashioned cattle you see in old photos. 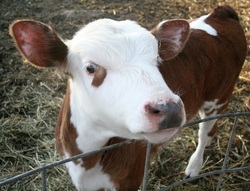 Holstein: Originally bred in Northern Germany, and the North Holland/Friesland regions of the Netherlands. These familiar black and white cows were selectively bred to make large quantities of milk from the area's most abundant natural food source- grass. First brought to the U.S. in the late 1850's, their ready adaptability, and economic production of large volumes of milk relative to other cows has made them common on dairies worldwide. Figures for average milk output range up to 28,000lbs./12,700kg (~3260 gallons) per cycle, with 2.5-3.6% butterfat, 3.2% total protein. Ayrshire: The first cows of this breed were thought to have arrived in New England from Scotland's County Ayr in the early 1820's. Well adapted to rocky farms and harsh winters, the Ayrshires thrived, eventually spreading to dairy farms all across the country. Average output is 17,000lbs./7,711kg (~2000 gallons) of milk per 305 day-cycle/year, with 3.9% butterfat, 3.3% total protein. Jersey: Developed on Britain's Isle of Jersey, close to the Isle of Guernsey just off the coast of France. 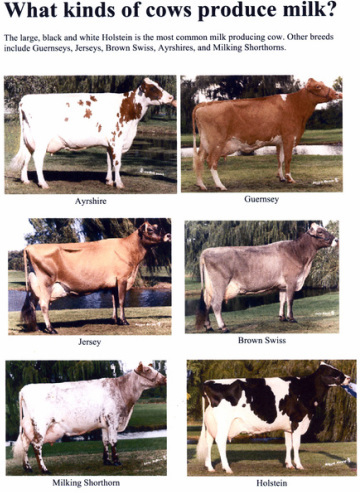 With a history as a pure breed that dates back several hundred years, they are descendants of stock from the French region of Normandy.The 1850's saw the arrival of the first Jersey's in the U.S. Like the Guernsey, they, too, are small, but produce relatively large amounts of milk- on average, 16,000lbs./7,260kg (~1860 gallons) per cycle, with a high butterfat content of 4.9%, total protein 3.7%. Dolly's and Daisy's heifers born in late August. Our matriarch, Daisy and her third heifer, Dutchess.